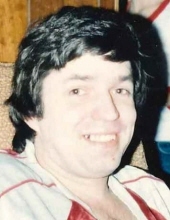 Mark "Bucky" Wilson, 60, Appleton, passed away Wednesday morning, April 10, 2019. He is the son of the late Chester and Mary Ellen Wilson. Bucky enjoyed puzzles, crossword, books, watching Wheel of Fortune, playing Bingo and following the Packers and Badgers, collecting coins, and was a pretty good welder. He is survived by his siblings; Lori (Pat) McGuire, Debbie Wilson, and Scott Wilson. Nieces and nephews; Lisa, Susan, Jazlynn, Todd, Pat Jr., Chris, and Stacy, Shane as well as great nieces and nephews,as well as many friends. He was preceded in death by his parents. To send flowers or a remembrance gift to the family of Mark "Bucky" Wilson, please visit our Tribute Store. "Email Address" would like to share the life celebration of Mark "Bucky" Wilson. Click on the "link" to go to share a favorite memory or leave a condolence message for the family.